Elon Musk didn’t invent the idea of drilling holes into Los Angeles. George Warren Shufelt did it first. One of the more colorful urban legends of L.A. is that of the Lizard People, an advanced race of humans who created an underground city here some 5,000 years ago. According to the story, incalculable riches and gold tablets with the origins of human civilization carved into them were just waiting to be discovered by some savvy treasure hunter. This super-race, allegedly related to the Mayans, had purportedly fled a catastrophic meteor shower and created several such communities along the Pacific Coast, including the one in our dear basin. The so-called Lizard People were so intellectually and technologically advanced that they used mysterious chemicals to dig a network of some 285 tunnels fully equipped with vast chambers (large enough to accommodate 1,000 families who lived off of a store of food and water placed there by the tribe). This story, loosely drawn from a Hopi Indian myth by a tribesman called Chief Green Leaf, was told to a geophysicist and mining engineer named George Warren Shufelt in 1933. As it turned out, Shufelt had invented what he called a “radio X-ray machine” (which he believed could detect underground tunnels). Add to that the promise of an ancient sheepskin map held by two other treasure seekers, and you have a tale that went viral by 1933 standards. Shufelt’s quest for the Lizard People’s golden treasures was picked up and followed closely by the Los Angeles Times and in turn the Associated Press, which spread Shufelt’s search for the lost catacombs and their inhabitants all across America. The entire underground city, appropriately shaped like a lizard, reached from Elysian Park (the lizard’s head) to today’s Central Library (the tip of the tail). Shufelt swore up and down that he had discovered the exact locations of 1,900 square feet of tunnels, rooms with 9,000 feet of floor space, and 16 places where gold was stored all by using his radio X-ray machine. 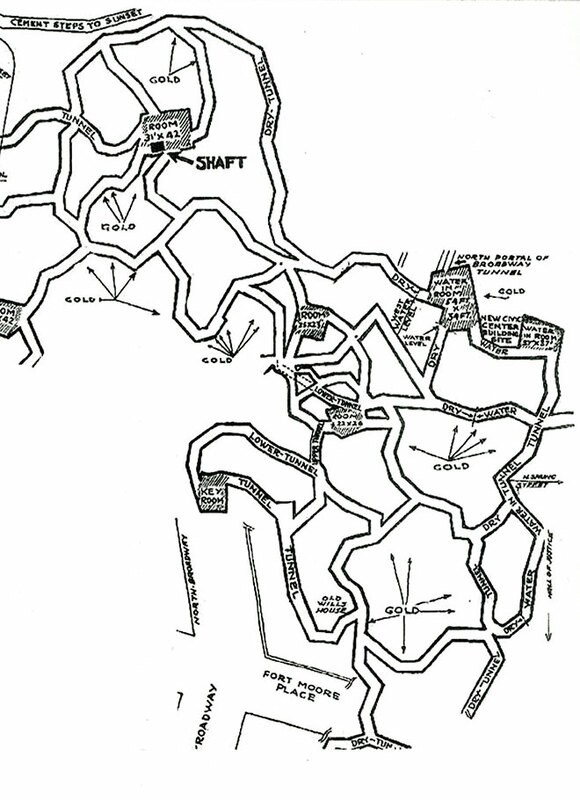 He created this map of the passages below the surface of Fort Moore Hill. After getting permission from the County Board of Supervisors, he began a dig up on North Hill street “overlooking Sunset, Spring and North Broadway” that was watched like an engineering soap opera by folks in the grip of the depression. The wildly speculative newspaper reports insisted that the buried treasure was Spanish gold planted in the colonial period and that the crew felt they were ready to bring it out after 28 feet of shaft was sunk. The deal made by Shufelt and his small team of associates was a 50-50 split with the county, but the dig was plagued by challenges (dense boulders and plenty of mud after the shafts passed the water table). Some “experts” claimed the dig must reach 1,000 feet, and while Shufelt did accomplish 250 feet, he found no gold or tunnels. When winter turned to spring the digging stopped, as the money dried up and the newspaper stories vanished (along with the radio X-ray). G. Warren, as he was called in the days of the great Lizard City quest, stayed around Los Angeles and finally passed on in North Hollywood in November of 1957, leaving behind a great story and this memorable map.